Hey there! I know, I've been fairly quiet, but that's 'cause I've been very busy. Doing what, you ask? Finalizing edits on Alien Research, starting Alien Collective, and hitting some movie premieres, because it's good to be a reviewer for Slice of SciFi. But, things have been going on, so let's get to them, shall we? We shall! 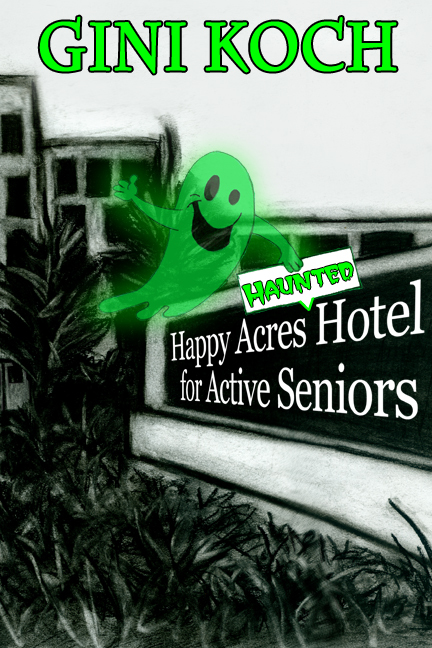 First up, if you've been waiting for the physical copy of The Happy Acres Haunted Hotel for Active Seniors wait no more. It's now available at Amazon, and will be at some independent bookstores soon. Next, and speaking of movie reviews, check out my latest review, of Star Trek: Into Darkness, over at Slice of SciFi. Then, see what Bring on the Books thought of Alien in the House. I also saw The Heat, and because I'm a giver, here's the review, hot off the presses, no waiting! The Heat stars Sandra Bullock and Melissa McCarthy in a buddy cop movie. I really enjoyed this movie, for a lot of reasons, not the least of which being I love Sandra Bullock and I think Melissa McCarthy's hilarious. But I also enjoyed it for the very reasons it was made -- because there aren't enough buddy comedies for and about women out there. Sandra's the straitlaced, really good FBI agent who isn't liked by her male coworkers because she's smarter and better at the job than they are. Melissa's the sloppy, break the rules detective who doesn't want the FBI on her turf. They have to team up, of course, in part because Sandra's bucking for a big promotion and her boss is telling her that if she teams up with the local detective and if she solves the case, she may get the promotion. But since she's not well liked, it's an iffy subject. Melissa, on the other hand, has her precinct under her very effective control. They're afraid of her, but she's the best cop there, and they all know it. It's following the standard buddy cop formula you've seen, and loved, in countless other movies, and it works here because a) the formula DOES work, b) the script is good, and c) the leads have good chemistry on the screen and with each other. One of the most interesting things for me about this movie is that if you put two men into the leading roles, the movie would work exactly the same way as it does now -- it'd be really funny with a lot of action, a tiny bit of romance, and your typical Odd Couple pairing. Right up until the ending. I'm not going to spoil the ending, because it's a right on ending. But I think it's an ending you wouldn't get if the two leads were male. You'd get half of the ending, Melissa's ending, for certain. But Sandra's? That ending would be different. Sadly, Sandra's ending is the real world ending. I realize this is vague, but I don't want to ruin a fun movie by giving away its ending. But when you get there, think about how Sandra's ending would have been if, say, her character had been played by Mark Wahlberg or The Rock. The one thing I hated, and I do mean HATED, about this movie? It's opening and closing credits. They're literally like something out of the 1970's, and there's no real reason for it (other than the production team feels this is a kind of throwback film to that era of moviemaking). However, it sets up the moving badly, and ends it badly. I can't think of another movie where the opening and closing credits have turned me off so much that they caused me to lower my grade on the film, but there's a first time for everything, and this is that time. There's some gross humor, and this movie earns its R rating, mostly for language and violence. I enjoyed it, I laughed pretty much all the way through it, and give it a very solid B+. It missed an A- due to those awful credits. I'm a tough grader, what can I say? That's it for today, but as always, more's on the way. So, enjoy the downward slide to the weekend, and let's be readers out there! Peace out, my li'l gangstas, and I'll catch you on the flip side! Happy Tuesday! Hope everyone's having a wonderful start to the week, and hope all the dads out there had a wonderful Father's Day. It's been the usual bedlam as viewed from the air over here, but we have lots going on, so let's get to it, shall we? First off, see what boeklogboek thought of my latest novelette release, The Happy Acres Haunted Hotel for Active Seniors. Then see what Drugs Called Books thought of Alien Tango. And then see what SF Reader Community thought of Touched by an Alien. I got to go see a preview of Joss Whedon's "Much Ado About Nothing" (yes! I left the house for something other than a con! ), so go check out my review over at Slice of SciFi. After that, head over to Killradio and check out last week's At The Show where cool DJ Bob dedicates another song to moi! It's the 13th track, Tears for Fears' "Everybody Wants to Rule the World". Then, check out what Larissa's Bookish Life thinks are the top covers, so far, of 2013. That's it for today, but as always, more's on the way. So enjoy heading towards what, in the U.S., is the first official day of summer (Friday) and what in Arizona is the second real month of summer. (But it's a dry heat.) (We swear.) Peace out, my li'l gangstas, and let's be readers out there! Hey there! I'd have gotten today's blog up a trifle earlier but was chatting with the Awesome Editor about many things, San Diego Comic-Con and Alien Research among them, and time got away from me. So let's get to what's going on, so I'm not even later, shall we? We shall! Head over to The Nerdy Paige where the yap's large and in charge at today's Nerdy Notes. Yes, it's a new interview, and some new questions are asked, so definitely check it out. Next, see what Drugs Called Books thought of Touched by an Alien. There's also a new Playlist up at the site, and new Team options at the Alien Collective Depot. And last but in no way least, I have a new novelette release. Check out "The Happy Acres Haunted Hotel for Active Seniors" -- an urban paranormal with a little romance and a lot of humor. Welcome to Happy Acres, where the residents, both living and dead, are always happy to meet new friends, spark new romances, and occasionally get rid of odious relatives. Enjoy the read, available via Amazon, B&N, and Smashwords. Physical copies will be available soon via Amazon and selected booksellers. That's it for today, but as always, more's on the way. So enjoy the downward slide towards the weekend and let's be readers out there! Peace out, my li'l gangstas, and I'll catch you on the flip side! Happy Friday! Just a short one today. And yes, for those who've been following me a really long time, it's true -- It's Time for a Rant is back. As mentioned and promised on Wednesday, there's been a lot of brouhaha going on and going down over a variety of things related to SFWA and scalemail bikinis and more. My views on this are now live over at both Slice of SciFi and It's Comic Book Day, replacing this month's review column. Comments welcomed and encouraged at both sites -- the editors really appreciate knowing that articles get read, etc., and we'd all like to hear your thoughts on the subject. That's it! Have fabulous weekends and let's be readers of whatever we want out there. Peace out, my li'l gangstas, and I'll catch you on the flip side! Happy Hump Day! Well, Arizona Dreamin' was a lot of fun, and coming right after Phoenix Comicon means I was also a lot of tired. LOL But I'm done with cons until San Diego Comic-Con next month, so revving back up. My con wrap up is coming (still), but there's again so much going on that it'll have to wait while we get to all the new! First off, head over to Shadowhawk's Shade where the yap is large and in charge, talking about names and how I create and use them. Next, head over to The SF Site and see what they thought of Alien vs. Alien. Others have managed to get their Phoenix Comicon recaps done. So, head over to I Smell Sheep for some fun con pics, to They're Biodegradeable for Marcy Rockwell's take on things, and to More Geek Than Gay for a full blown (2.5 hours!) worth of podcast mostly about the con, complete with clips. Some of you have asked, and Team Gini has answered. There's now a complete, easy-to-read Bibliography at the website, linked off of the Bookstore page. So, check out what deathless prose of mine you might be missing. Change to the information on DarkCon -- I was told the wrong dates, so here are the REAL dates for this con: January 9-12, 2014. SO, please alter the plans made and make plans to attend -- I'm the Local Author Guest of Honor and it's gonna be a big party you don't want to miss! And now, for something kind of completely different. Two somethings, really. First, for those of you who've been asking me when the next Alexander Outland book would be coming, I direct you to Media Bistro and A View From Corona for the explanations of why there's been no sign of Book 2 and why I can't tell you when Book 2 will be coming. But I do plan on writing at least two more books in the Alexander Outland series...I just can't yet tell you when to expect them. Second, there's another kind of drama going on related to SFWA. For a good recap, check out this article at Adweek. Then check out the plethora of author responses, nicely collected by author Jim Hines. Then...I wasn't going to actually participate in all of this, feeling that Kitty and Victoria and my other female characters already speak my thoughts clearly, but author Stuart Sharp has pulled me into it, with the Huffington Post coming down firmly on the side of women authors being allowed to write whatever they want, and Sharp giving his rebuttal of same. My response to this will be my June column at Slice of SciFi/It's Comic Book Day!, going up somewhere in the very near future, just as soon as my editor there can find the appropriate beefcake and women in uniform shots. That's it for today, but as always, more's on the way, hopefully but not limited to my con recaps. So, enjoy the downward slide towards the weekend and let's be readers out there! Peace out, my li'l gangstas, and I'll catch you on the flip side!